This is a simple resource on how to read the full email headers, also known as long headers or internet headers, from an email message in various email clients. 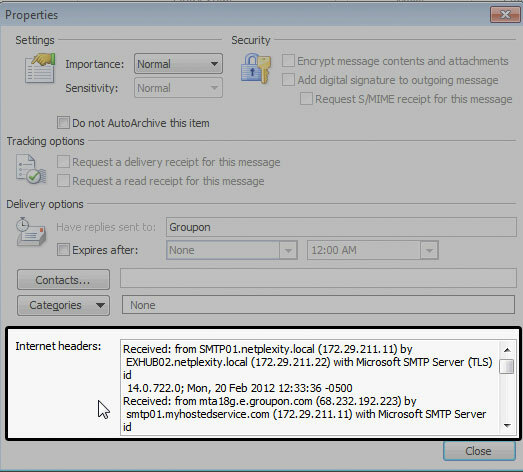 Headers include such details as sender, recipient, subject, sending time stamp, receiving time stamps, and much more. They are very useful in troubleshooting common issues, such as tracking spam, correcting catchalls and bounced messages. All (mt) Media Temple webmail clients can be accessed at either webmail.example.com or example.com/webmail. 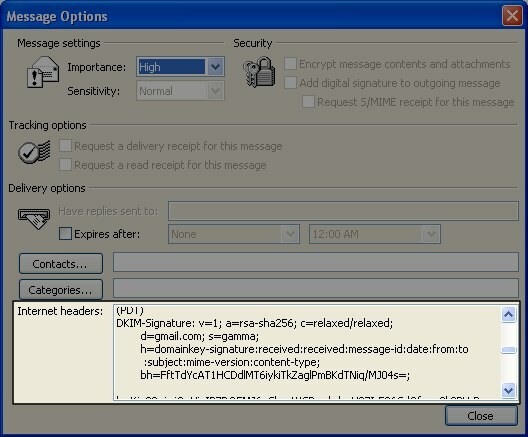 Log into Mail by (mt) webmail client. Click the message preview in either two- or three-pane view to read the full message. Click the down arrow in the upper right corner and select View Headers, see Figure 1. Log into Atmail - Advanced (Mozilla). Double-click to open the email message. Click on the "View Headers" icon in the top menu. The icon is an envelope in front of a piece of paper. A new window, with the full message and headers, will open. Choose "View" at the top menu and select "Customize Toolbars." Drag the "Full Headers" or "Long Headers" icon into your toolbar and save changes. See Figure 1. Now, you can click on "Full Headers" or "Long Headers" to the top of the toolbar. 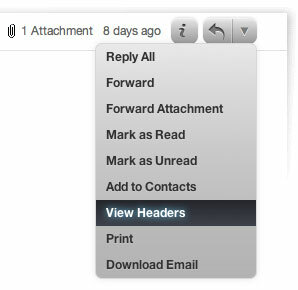 Select the email message for which you'd like to view the headers. Click on File, see Figure 2. Click on Properties as in Figure 3. The new window contains the headers. See Figure 4. 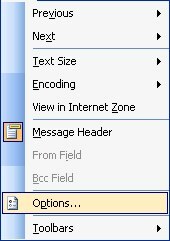 Select View > Optionsfrom the message's menu. Right click on the message and select Properties. Choose the Details tab and select the Message Source Button. Select View from the menu and click on Internet Headers. You may need to use your mouse to pull down on the line below the header so that the entire header is visible. From the menu bar, select View > Headers then choose All. The headers should be immediately displayed. Click Full Headers at the top of your message. The full headers will appear above the message text. Hover (do NOT click) over the email for which you want to see the headers. Right click to get a new menu of options. Choose the "View message source" option. Now, the full headers for the email you were hovering on will be displayed. Log into Windows Live Hotmail. 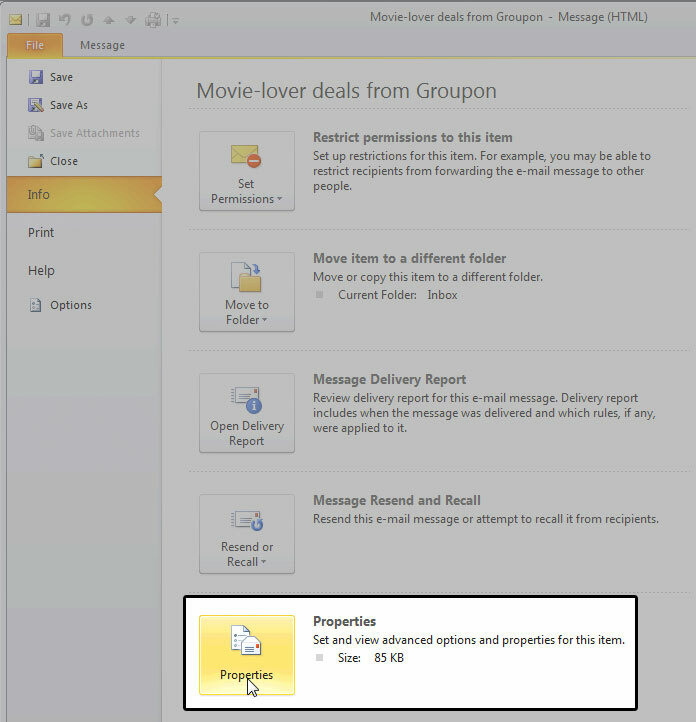 Click on the desired message in the list with the right mouse button. Select View source from the menu. If your email client is not listed above, you may need to contact the software creator for support on how to view email headers. If you are asked for a copy of a email header for troubleshooting, it is important to realize it may change if an email is forwarded. This is why it is important to get a copy of the original header.